Normally I'm anti-ugg (too many girls in mini skirts with uggs when it's 90 degrees out-- big turn off). BUT... I have to tell you-- these are ADORABLE -- and they look so great on your baby boy. He's so precious! What a great picture! Thanks everyone for the great compliments! I appreciate it! The yarn is Vanna's Tangerine Mist. They didn't carry it at any of the local stores, so I ordered it online. It is perfect for an orange tabby. I washed the items with fabric softener to make them all nice and silky (Vanna's yarn isn't super-soft). A friend asked me to make a hat for her sister and a matching baby hat for her sister's baby-to-be. She wanted them to look like orange tabbies. I didn't get a pic of the baby hat... will post that eventually. For now, here is a picture of me modeling the mama hat. The baby hat is identical (well, smaller, but same stitch and border) with the addition of earflaps and ties that look like cat tails. 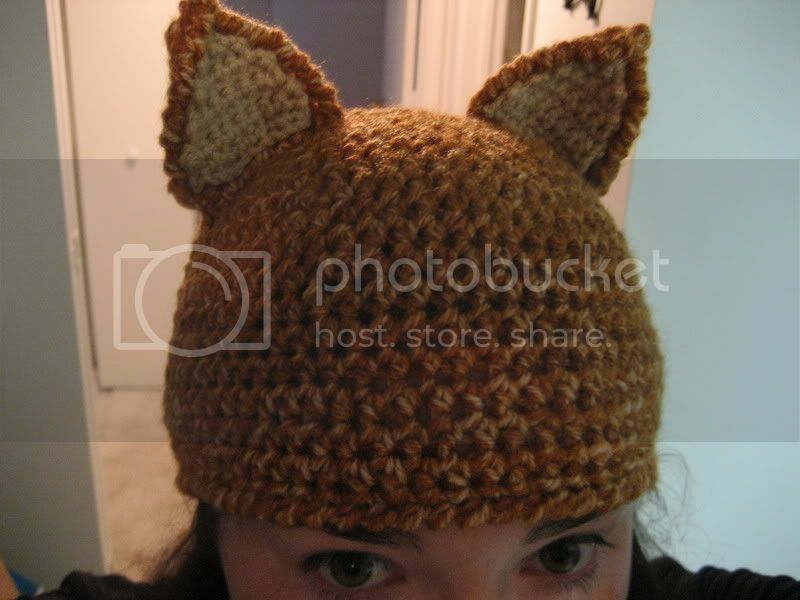 Both are my own design (ie, improved)... but there are tons of cat hats out there in knit and crochet if you are looking for a good pattern. 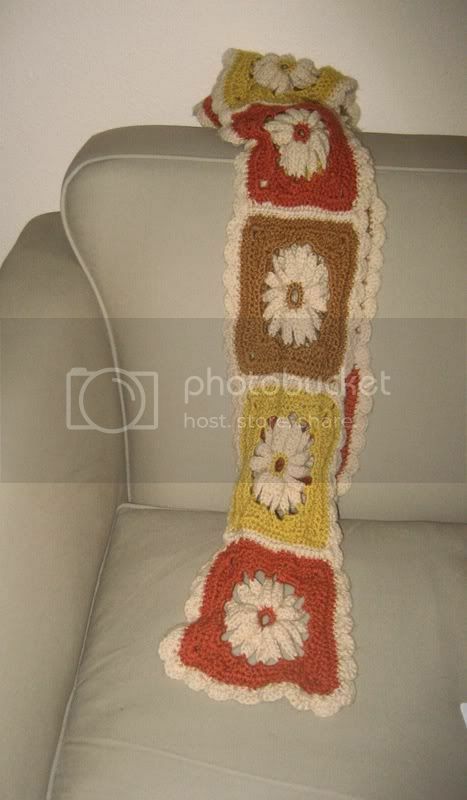 The second item is a daisy scarf I made for a friend of mine that loves to wear warm oranges and yellows. I used a daisy square pattern found here: http://www.geocities.com/granniegroup/Delightful_Daisy.html?1002301595350 and just stitched them together and added a border. I changed the daisy square pattern a little bit-- but that's mostly because I hate following directions. beautiful mirror--- every girl needs one of those! the pattern choice is great -- very pretty! Did you work from a pattern? 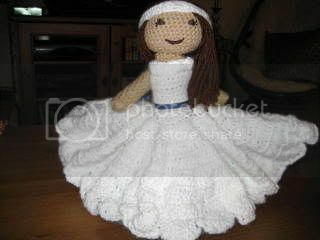 Or have a doll pattern to start with?? No pattern, she was 100% improvised. 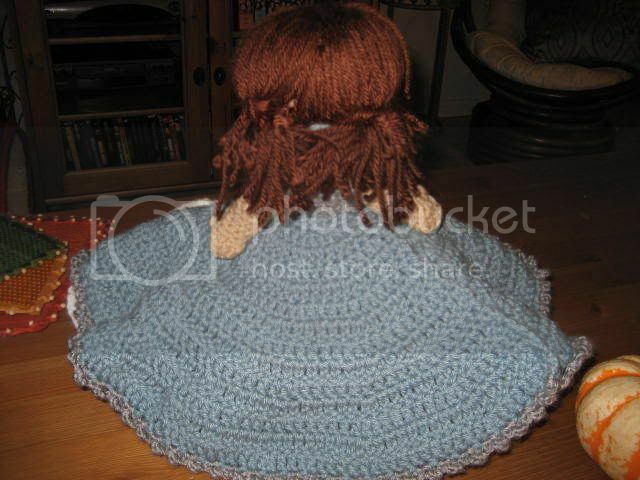 Though, she's mostly in sc so she's pretty much constructed just like amigurumi dolls. I almost stopped making her a few times in the early stage because she looked like something really perverse (really phallic!!) but that's because it was flesh colored and I made her clothes after I designed the body/head/arm layout. But, I'm glad that I stuck with it! What I did is made two heads and a long, tubular body. I made the heads both the same size and made sure that they were pretty flat on top (so she can stand on her own - which she can). 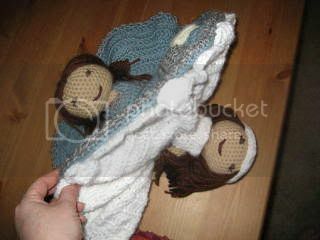 Then I made 4 arms... attached those pieces together and then crocheted the clothes. 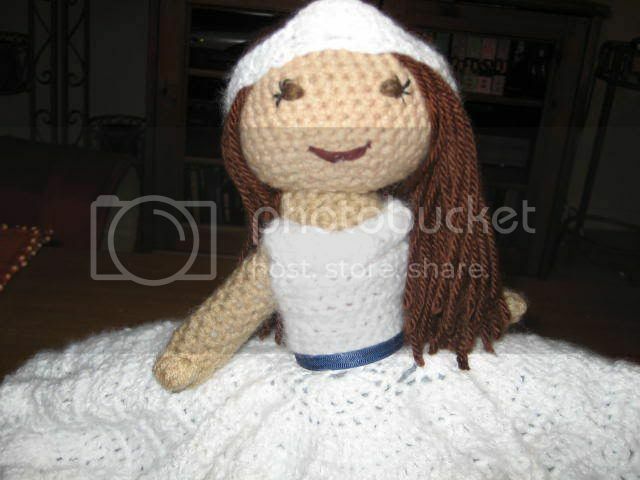 I love that so many people had these dolls/ remember them. They really are pretty kick a** I loved mine!! 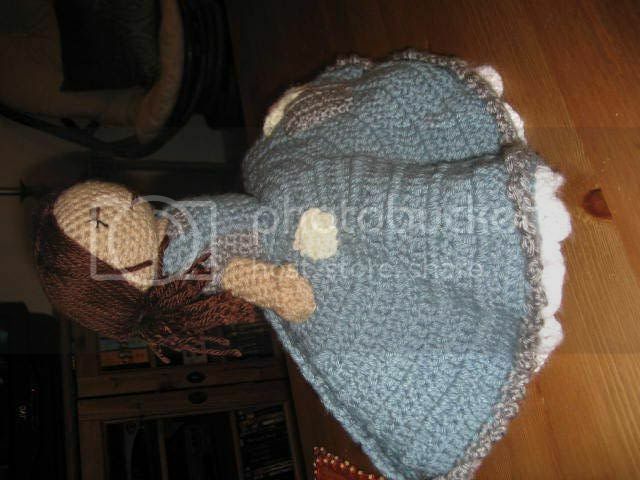 it's neat to hear that other people had dolls like this, too. 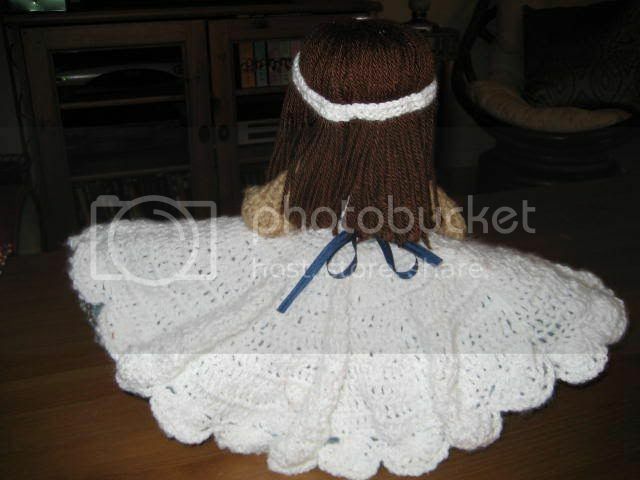 The cinderella doll I had was made of cloth and was tres 1970's. I really wish I had a picture of her! All of my sisters had her at one point (I have a lot of sisters!) and we all loved her. If anyone has any questions on her construction - feel free to ask. She'd be great at a storytime like a few of you suggested. And hopefully she won't scare my niece - sorry to hear merricat17 that yours freaked you out, but I could totally see that. Especially with a wolf! Thanks again for your compliments and for checkin Cindy out! Once I fix her tiara and make it pretty I'll post an updated pic. That is stunning! I love the fabric - need to find it!!! Just beautiful and suits the shape well. Great construction. Just so fun and hip. 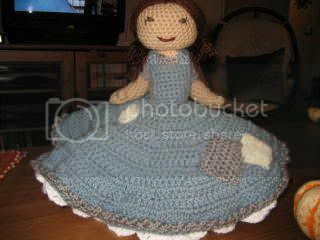 My sisters and I had one that we all played with when we were little girls and that doll which is long gone was the inspiration for this one. 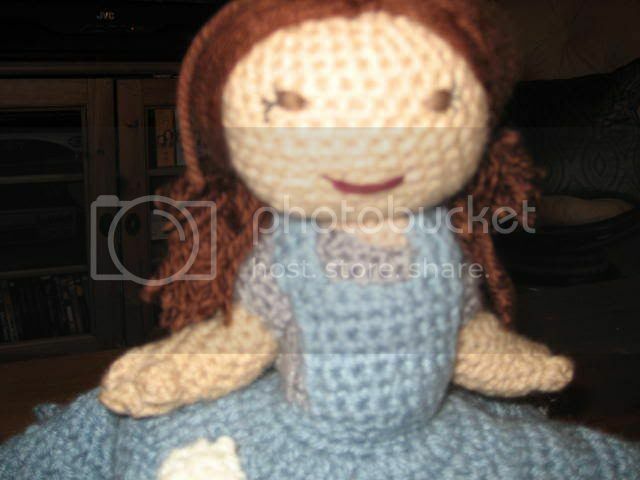 I made her with brown hair, though, since my niece has brown hair. I think every little girl likes to have a doll that looks a little bit like them. I am going to change two things on this design - redo the tiara on the glam side (it currently looks like a sweat band a la Olivia Newton John) and I'm going to add a broom to the Cinderella in Rags side. Here she is in "rags". This looks a lil weird & perverse-but it shows how the doll works. Here is her "glam" side. Ready for the ball. I'll try to post another pic when I fix her tiara. Hey - the comic is actually a drawing of me and one of my best friends. It was done in Little Tokyo by an artist. I framed it because I thought it turned out super-cute.